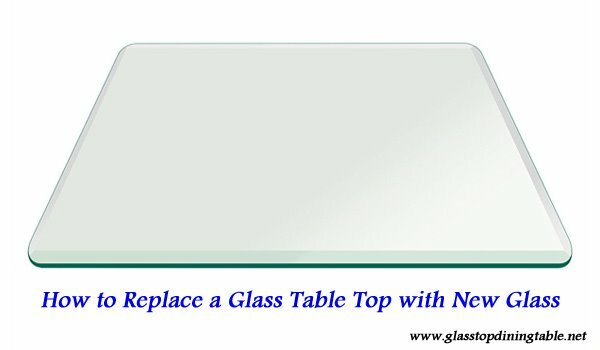 Many people need to know the correct way to replace glass table top. Many of them arrive at this stage due to a number of things such as the old glass being broken or damaged by scratches that make the appearance ugly but before you start you should read this article about how to remove scratches from glass top dining table and after reading it If you want to replace the old glass with a new one, or if you can successfully apply one of these methods, if the main reason for replacing the glass is to break the old glass, you can follow the correct way to replace the glass table top. 1 - Use the measuring tape to measure the dimensions of the glass accurately, and the thickness of the glass by measuring the thickness of the old glass (the implementation of this step correctly and accurately will facilitate the second step) prefer to take measurements by Centimeter and then converted to an inch by dividing on 2.54. 2 - Bring a paper and pencil and draw the table surface on the paper and preferably that the paper is equivalent to the size of the table so you can draw easily and you can determine the curves in the table, and if you can not provide the appropriate paper size You can use your own skills in the drawing to draw a thumbnail of the table in size Printer paper taking into account the dimensions measured in the previous step. 3. Here we will pause a bit to calculate the required glass thickness. Some may ask for the same old glass thickness, others may want a larger thickness than the old ones. In both cases, you should take a sample of old glass to compare with the new glass if you buy glass from a place near you. If you want to buy from the stores on the net you do not need to take a sample of the old glass only you have to know the thickness of glass you want to buy. 4 - Determine the color of the glass if it is transparent or colored, there are many colors of the glass such as light green, dark gray, bronze and light gray, and you should choose the color of glass suitable for you and decor of the dining room. 6 - In the end you must determine the place of purchase, but you first search the Internet, where you get information about shops and local and international companies and shows you the price for each type, you should search hard to get a good type and a cheap price. 7. After determining the place of purchase. We come to the last and most important step, assembly the new glass with the table, you should be careful while assembly the new glass and there must be someone else to help you in this work.